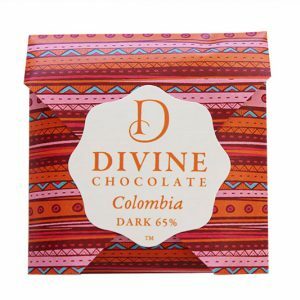 Divine Ecuador chocolate is made from the Trinitario cacao bean grown in the San Vicente de Chucuri Valley of the Santander in Columbia. Creating a long deep chocolate flavour with hints of spice. Cacao 65%. Cacao beans. Sugar. Cocoa Butter. Soya Lecithin. Vanilla Beans.